The president feels that the staff should show support for those accused of wife beating and other alleged related abuse incidents. 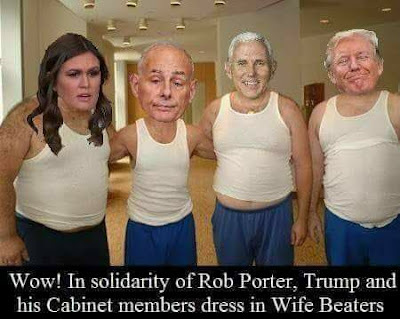 Initially, this was to be done only in support of Rob Porter. It quickly expanded to include the cabinet and then the entire staff. The president feels that this will serve to show support for any other staffers accused of similar incidents in the future. All wife beater shirts must be white and only white. The president likes white on his staff. For now, the wife beaters will be worn with blue sweat pants but white sweat pants have been ordered and will arrive in a few days. White sneakers will also be de rigueur. When asked if any insignias, logos or words would be added to the clothing, Sanders quickly took a question on a different subject from a FOX "News" "reporter" who was dressed in a white wife beater. I'd pay good money to have Sarah put a shirt on.